Among water’s unique properties is that one side of each water molecule is slightly negative and the other is slightly positive. Individual water molecules, therefore, attract other water molecules like little magnets as the slightly positive portion of a water molecule is attracted to the slightly negative portion of an adjacent water molecule. In this way, water molecules ―stick together. Due to water’s polar nature, a large number of substances will ―dissolve in water. For this reason, water is often called the universalsolvent. Water is the only compound that commonly exists in all three states (solid, liquid, gas) on Earth. Additional properties of water are its high surface tension and the large range of temperature (0–100 degrees Celsius) in which it can be found in the liquid state, as well as the fact that, unlike other substances, solid water is less dense than liquid water. Water is able to absorb thermal energy without showing relatively large changes in temperature. Large bodies of water act to moderate the climate of surrounding areas by absorbing thermal energy in summer and slowly releasing that energy in the winter. For this reason, the climate near large bodies of water is slightly milder than areas without large bodies of water. Water (rain, ice, snow) has shaped our environment by physically and chemically weathering rock and soil and transporting sediments. Freezing water can break rock without any change in the minerals that form the rock (physical weathering). This usually produces small particles and sand. Water with dissolved gases and other chemicals causes the minerals in rocks to be changed, leading to the deterioration of the rock (chemical weathering). Most of Earth’s water is salt water in the oceans (97 percent). Nonfrozen, fresh water makes up less than 1 percent of the water on Earth. Water is essential for agriculture. Crops watered by reliable irrigation systems are more productive and harvests more dependable. Water is an important resource used in power generation. 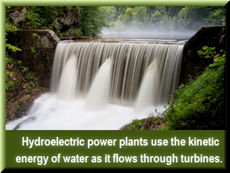 Hydroelectric power plants make use of the kinetic energy of water as it flows through turbines. Water is also heated in power plants and turned to steam. The steam is used to turn turbines, which generate electricity. In the past, streams and rivers were often used to dispose of human waste, and open sewers were common. During the mid-1800s, public health officials recognized the connection between disease outbreaks and contamination of public wells and drinking water. Advances in water treatment and sanitary sewers have helped eliminate diseases associated with human waste. Due to water’s importance in power generation, agriculture, and human health, it is important to conserve water resources. explain why ice is less dense than liquid water. relate the three states of water to the water cycle. infer how the unique properties of water are key to the life processes of organisms. analyze and explain the difference in average winter temperatures among areas in central and western Virginia and cities and counties along the Chesapeake Bay and Atlantic coast.